Your business has become totally dependent on computer technology. But… are your computing resources optimally configured? Are they communicating effectively? Do you know when a server sub-system fails or is about to fail? Do you have all the information required to resolve an outage at your fingertips? We all know unscheduled downtime can cripple your operations, reduce your revenue, and even cost you guests and homeowners. We can help prevent unwanted downtime! 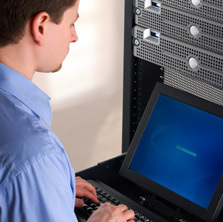 Because we understand that your computer systems are so important to your business and losing the use of your computing resources can be catastrophic, we have bundled three highly regarded services to protect your systems and optimize your Systems Uptime. Each is a standalone service designed to increase your Systems Reliability, but when deployed in concert they synergistically enhance each other. These services are designed to ensure that your systems are configured properly, continue to perform optimally, and are well documented to reduce downtime if an outage should occur or upgrades are required. Our Clients who currently utilize this bundled package highly recommend it!